the Windsors. Princess Diana’s hands show her to be markedly different from the rest of the Windsor royals, and such large differences do not result in happy marriages. In this post I will explore briefly the similarities and differences between Kate Middleton and her husband and in-laws. (Check out a photo comparison of the hands of the British Royals and also Kate's hand photograph). In these photographs you can at once see how differently Diana's hands are shaped. Kate’s broad palm (although her longish hand does take away from it) is similar to the shape of the palms of her in-laws and that of her husband Prince William. Her Headline is fine and balanced, broadly similar to that of William. Her fingers are fairly straight with a good medium set thumb. What this means is that intellectually she is suited to the Prince and shares a similar world view. Breadth of vision and common sense are the qualities she shares with most members of her husband’s immediate family. Kate is more broad-minded and reasonable than her father-in-law Prince Charles, but equal to her husband Prince William in these qualities. People like her and William usually get along with a diverse bunch of people, because they are sensible and pragmatic. Kate is also straightforward, direct and discreet (like other members of the royal family), and also a little timid, and these qualities would likely endear her to them. Kate Middleton’s hands are markedly different from Princess Diana’s. They show that she lacks Diana’s deeply compassionate and philanthropic nature, but then so do her Windsor in-laws. The royals maybe good people, but Princess Diana had an exceptionally developed humanitarian outlook which none of them possess. If one goes by hand reading, then it is highly unlikely that Diana, who was more of a romantic soul, could have connected with her daughter-in-law Kate at a deeper level. Kate’s hands show her to be a very smart and savvy person, unlike Diana. What makes the Kate Middleton different from the Windsors is her calmer nature as compared to their hot-blooded one. In fact Kate can quite distant and cold on occasion, although she is the nervous type. The nervousness is compounded by an inner timidity. Money and position are very important to Kate Middleton. If her hand shows her to be more materialistic than the Windsors, and Princess Diana, nothing wrong with that. It could be due to her down-to-earth and straightforward nature. All this is evident not just by the shape of Kate Middleton's headline and her limited mounts, but also her Apollo and Jupiter fingers, thumb setting and shape, and the texture of her palm and lines. Unlike some other royals wives Kate is not temperamental or moody (controlled mounts). She is not short-tempered, but she can be irritable. She is sensible and knows what she wants. She has a very good chance of keeping out of the tabloids, although nowadays even a breath of a scandal is enough for the tabloids to go on an overdrive. Read the hand analysis of other royals like Kate Middleton's husband Prince William or The hand analysis of the Princess of Wales, Lady Diana or The hand analysis of Prince Charles or check out the hand profiles of famous people from the United Kingdom. I am not sure why the Royal family members are still considered important in a democratically elected society. But since I am ignorant of the contribution that family makes to the UK society, I may not want to say anything else. DI, they had some survey on whether the British public wanted them or not, and the majority wanted them. Perhaps it some sort of romantic attachment to the royal family. 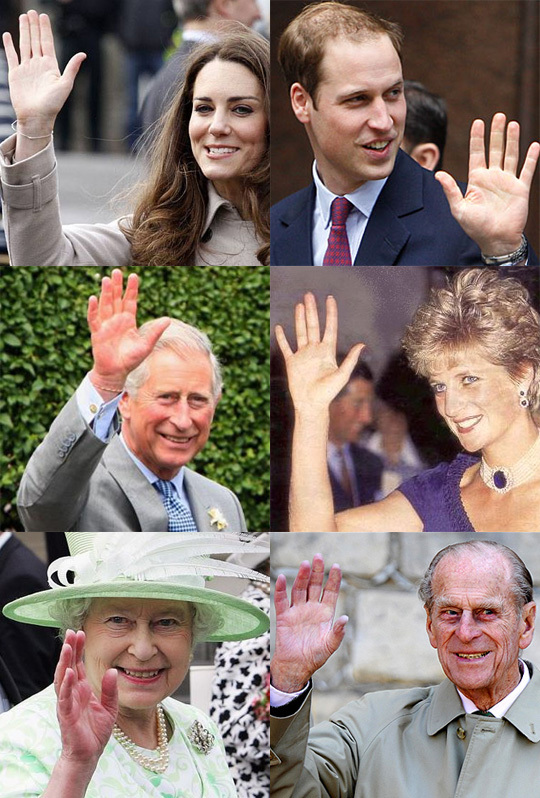 Actually if one looks at the hands of these royals, they are all very ordinary people and I doubt that they would have survived if they existed in the old days when they were actually kings and queens! It is only Diana who had an exceptional hand. She was not a royal, but she was an aristocrat and a true one. The reason I am featuring them here is not just because they are popular, but also because their hand photos are easily available. There are many people whose hands I want to read but its difficult to get decent hand photos.